Why does STEM have an Auction? The Louisa Boren STEM K-8 PTA supports basics like classroom supplies, all school assemblies, library books, gym equipment, field trips and the “extras” like Project Based Learning supplies, scholarships for before & after school clubs, technology equipment, PTA community events like multicultural night, back to school bash, and Pi day. The auction is our major fundraising event of the year. Our hope is that guests (adults 21+ only) feel inspired to donate at the event in support of the STEM community and we depend on the countless hours of volunteer time to pull the event off, and the community at large to donate thousands of dollars in items to the auction itself for us to auction off. The auction is broken into two blocks: a silent auction; with silent auction tables, games and mingling, and live auction; with dinner and a live auction with classroom art and larger package / higher ticket items. What will be different this year? SPRING FLING! The live auction has classroom art pieces that volunteers, teachers, and students create to sell at the auction. This Spring we will have a second event at Boren called “Spring Fling” open to the entire school community (kids too!) where families have the option to see the pieces created and get replicas of the live art pieces. More details coming soon on this event once it takes shape. Tickets – Paper tickets OR online! We couldn’t pull this off without volunteers! Please contact Robin: auction@stemk8pta.org if you can’t make it to an auction meeting and still want to volunteer! Upcoming Auction Committee meetings are: 7-8 pm at Uptown Espresso – Delridge. We need 25 donated desserts. Purchased desserts are welcome. Each dessert must serve 8-10. To donate a dessert, send an email to auction@stemk8pta.org. Sponsorship is another great way to support the auction! Levels range from $250 to $2,500 and include a variety of great benefits. Contact auction@stemk8pta.org for information on becoming a sponsor or in-kind donor or sign up here. Our auctions are themed! This year we are going best & worst of Seattle – coffee, mermaid, the sound, JP Patches, the gum wall, a mountain, Birkenstocks with socks, grunge, hipster, dresses or jeans – costumes welcome or “come as you are”. Circa – post Auction. Because it will be raining after all and no one will want to go home yet anyway. TICKETS ONLINE! RSVP DUE BY FEBRUARY 15! Don’t want to buy Tickets online? Hard copy order forms will be sent home in kid mail OR CLICK HERE to download a form. 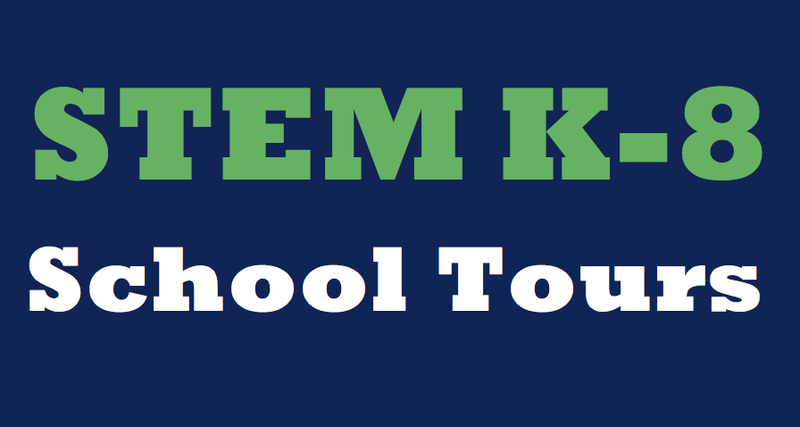 STEM K-8 is hosting school tours in January and February. These tours are open to any families of children entering kindergarten through 8th grade. We host separate elementary and middle school tours to address the specific questions and concerns of each group. STEM will also host Open Houses for elementary and middle school families. No reservations are necessary to attend an Open House. Reserve your spot on one of these tours. 6th Annual Book Fair Blizzard is a Big Success! Thank you to everyone who came to our Book Fair Blizzard! in Scholastic Dollars, which will be used to buy new books for classroom libraries and the STEM K-8 Library. Scholastic Dollars also pay for all sorts of library items including headphones, bean bags, comfy chairs, rugs, and bookcases. 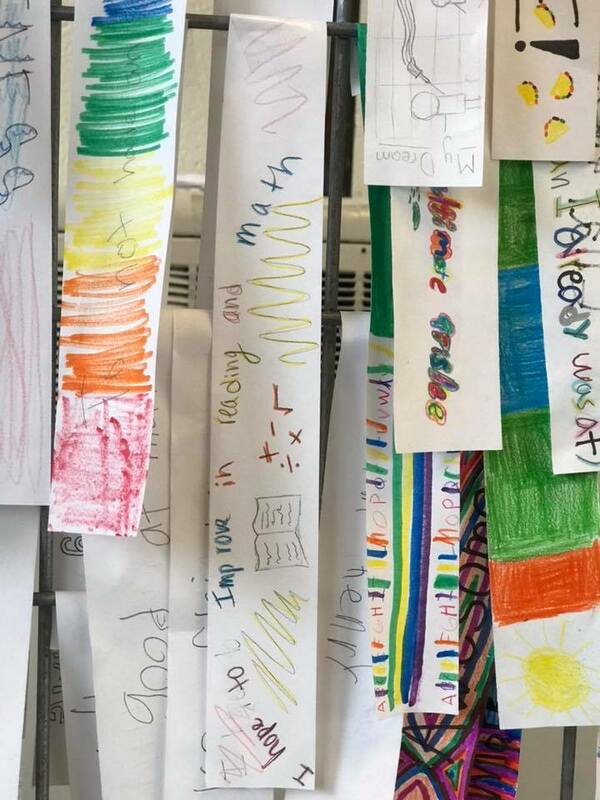 The proceeds from our eight Book Fairs – six Book Fair Blizzards and two spring Book Fairs (Story Laboratory and Book Fair Fiesta) have enabled us to buy lots of new books for our school! All for Books Raised $290! And a BIG THANK YOU to everyone who donated pennies, nickels, dimes, quarters and dollars to our All for Books campaign! Two Book Fairs in One! Ever wondered why our annual Book Fair Blizzard has SO MANY BOOKS? It’s because it’s actually two book fairs – an Elementary Fair (including PreK) and a Middle School Fair. 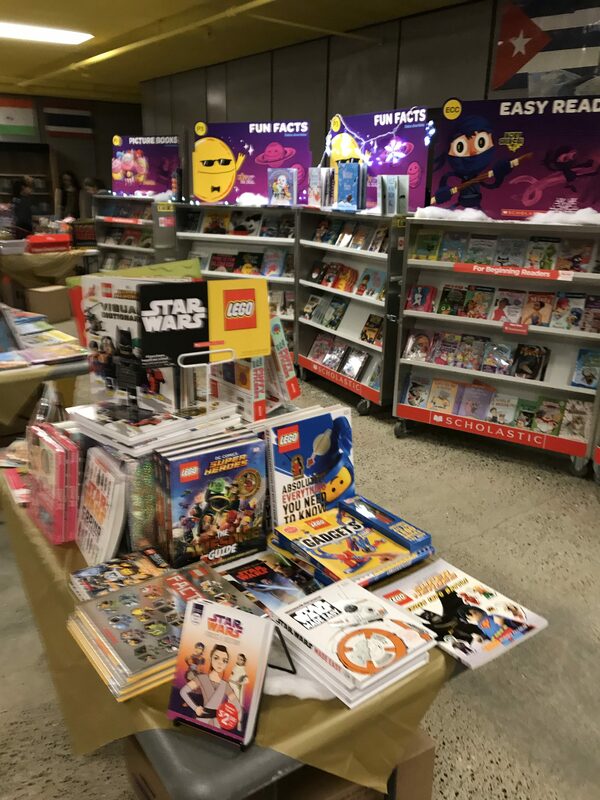 While Scholastic has a book fair option for K-8 schools, it doesn’t give middle-schoolers much choice in books – so we bring in a middle school book fair too! It’s a blizzard of books for everyone! Here you’ll find an even bigger selection of books pre-school through adult. You can also send wish-lists and e-cards to family and friends. Book Fairs App makes finding the right book a snap! Monday, November 26 is the start of our week-long All for Books campaign. 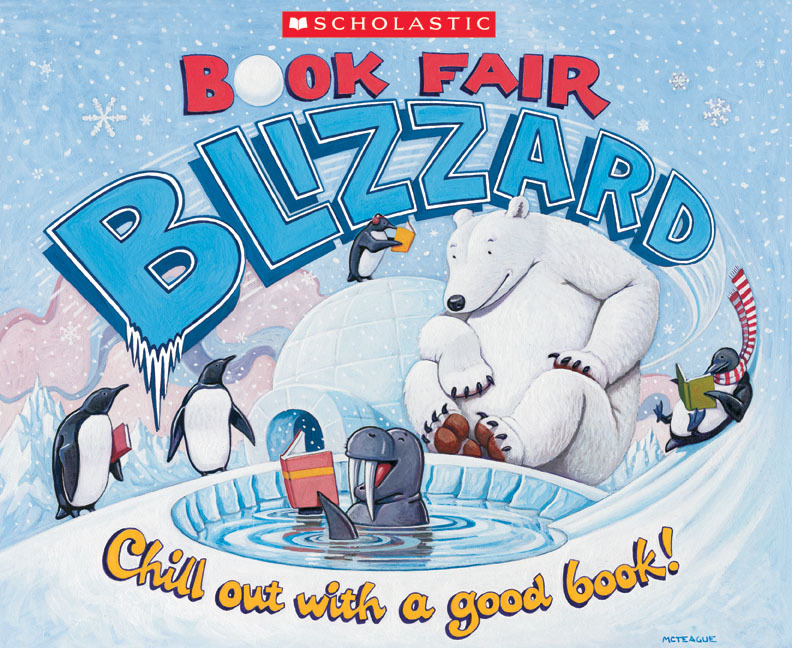 We’re raising money so teachers can build their classroom libraries during our Book Fair Blizzard (December 4, 5 & 6). The money we raise also helps readers beyond our school. 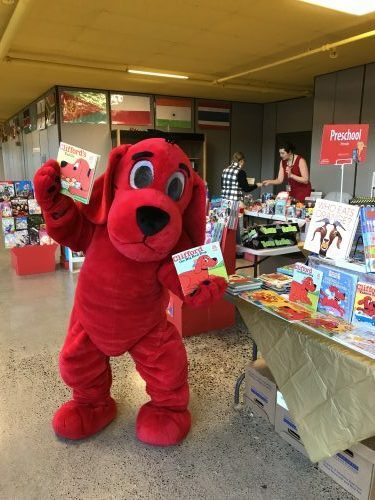 Every year, Scholastic matches the All for Books money raised nationwide with a donation of up to one million books to the Kids in Need Foundation and Kids in Distressed Situations, Inc.
Students can donate every morning at the school entrance between 8:20am and 8:50am. Our goal is to beat our record of $560! With matching gifts, reoccurring donations added in, and all the numbers totaled – we’ve hit our goal! Every time this happens I get a lump in my throat and feel a huge sigh of relief. I feel really lucky to be at a school where families give what they can to support the learning being done and I really appreciate every single donation. The big ones because you are supporting other students besides your own, and the little ones because I know you gave what you could and it’s a sacrifice you made for our students’ education. Thank your neighbors, your families, your friends who gave into a community that needs the help to do big learning. We have so many great things still to come this year. Community events, assemblies, projects, field trips – all already being planned. So many more minds to be blown! Tax letters will go out by the end of the month and then my energies will turn towards the auction coming up March 23. I hope you choose a way you can participate. And don’t worry – you can ALWAYS donate to the PTA. We ALWAYS will take ANY donation. Time, treasure, or talent – it’s all important. 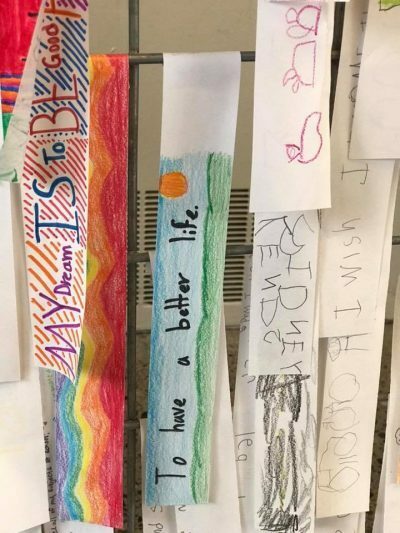 There is an art installation in the hallway called “Our Goals” – I’ve walked by it about 20 times now and Tuesday stopped for a closer look. 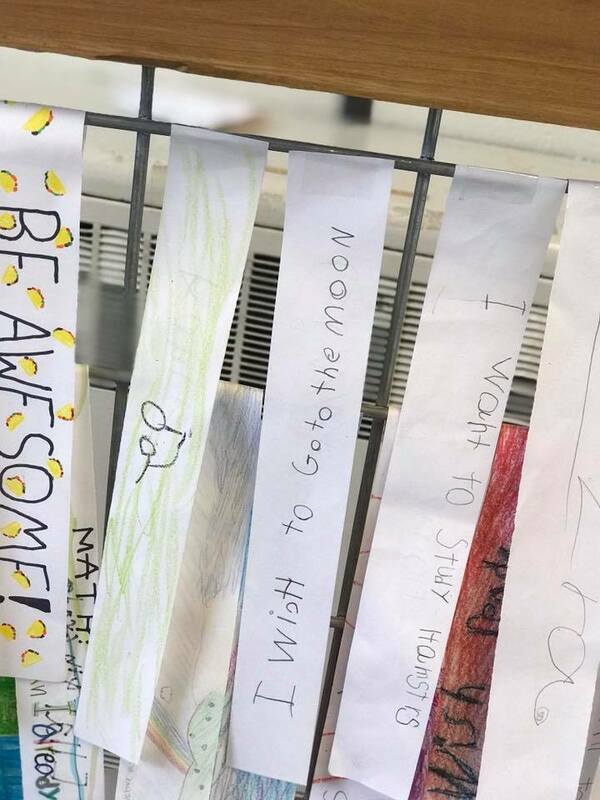 To go to the moon. I will be a better friend. I want to be a scientist. To study hamsters! To get better at math. Reading. Writing. 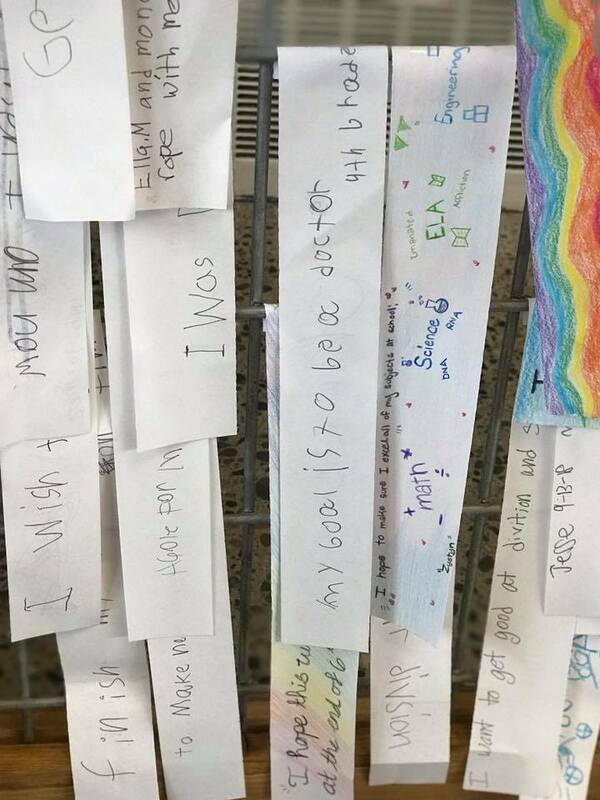 I like to think that teachers and the PTA help kids with these goals. That we change life trajectories. That we support our community with events. I’m an optimist – but I like to think all these goals are not only possible, but our guarantee – our promise. Some of these goals gut me – because they are not goals. They are just basic needs. Help me fund the PTA budget. The Direct Give is 6 more days and we are $18,490.00 short of our $37,000 goal. I want to fund all the things planned. 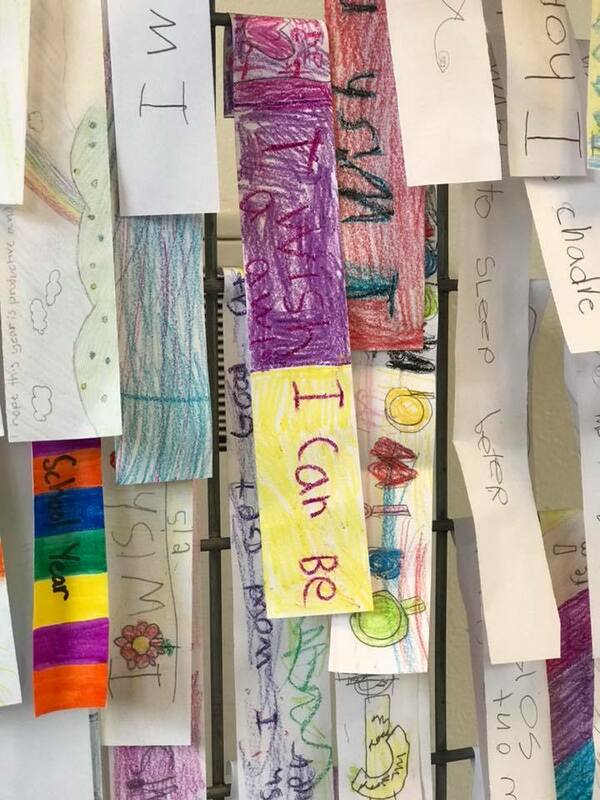 Every assembly, community event, every time a teacher says “can you pay for ______?” that we can say “yes!” and make the goals the kids have happen. The big long life ones and the little everyday needs ones. Help me. The first fundraiser of the year is our Direct Give October 1-31, State and local funding is terribly inadequate to support the vision of our school and provide the level of services, support, and materials we need for all of our students. The PTA serves as the roots of STEM and funds many aspects of our unique school. 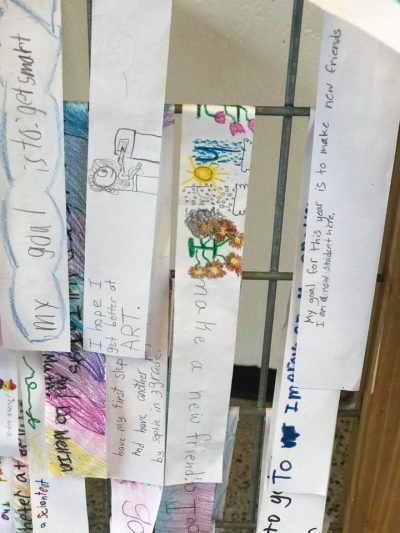 We’ve invested in technology, art, literacy, engineering, Project Based Learning, playground equipment, science fair projects, scholarships, teacher training, field trips, and our community. The PTA is a vital supporter of the tools, materials, books, instruments, equipment, supplies, software, and training that support every student, family and staff member at Louisa Boren STEM K-8. 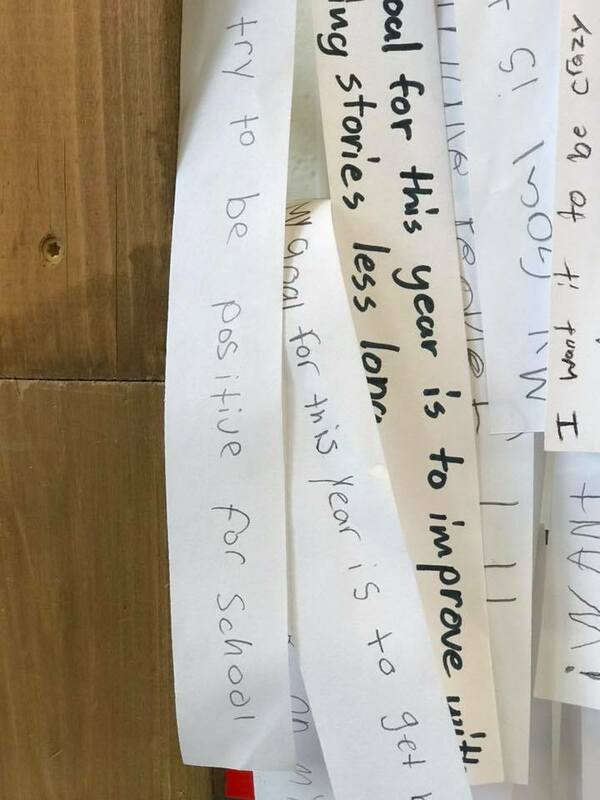 We’ve raised the goal this year to reflect the increase in classes and teachers, and to support this learning community that increasingly struggles to make ends meet. 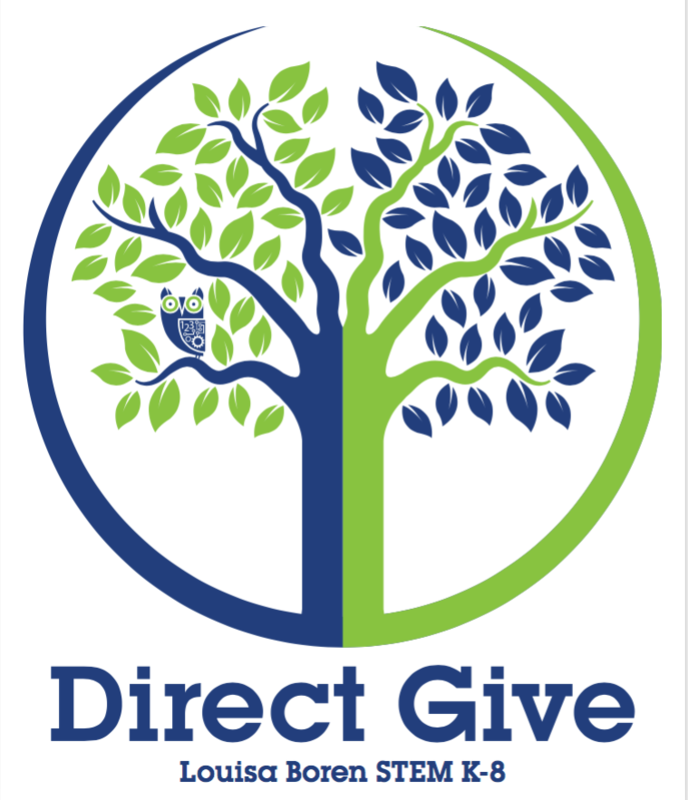 We chose Direct Give so that each and every dollar – every penny – you donate goes directly to the school. We don’t ask your student to sell anything, and we don’t pay a company any percentage to run a fundraiser. Each donation is tax deductible, and many employers will match donations, increasing your gift to our school and community. We invite everyone in our community (including friends, neighbors, and relatives) to give what they can today. Every dollar makes a difference. Go out on a limb for STEM. 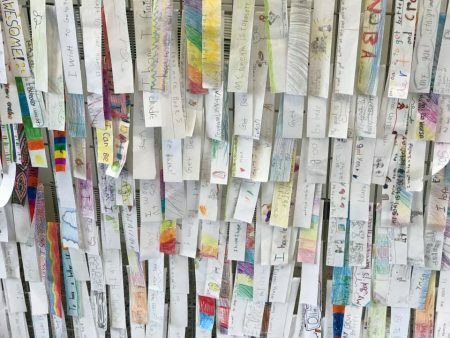 $1 every month for a year pays for a scholarship for one student to attend a show at Seattle Children’s Theatre. $3 a day for a month pays for a 7th and 8th grader to wear an apron or a coverall during CTE classes. $6 a day for a year pays for the 4th grade Blake Island Salmon Bake and Potlatch field trip. $20 a day for a year pays for nine teachers to have intensive math professional development. 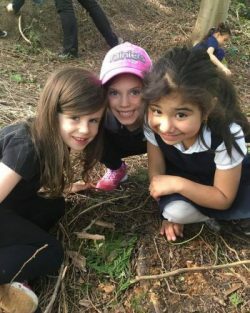 $23 a day for a month pays for three teachers to attend NatureBridge, an environmental science program. $25 buys “George” and “Hidden Figures: The True Story of Four Black Women and the Space Race” for the Library. $60 a month for one year pays to sponsor the African American Pancake Breakfast. 12 payments of $12.50 buys the jump ropes, hula-hoops, and balls for recess. $100 buys soil, planters, and seeds for a 2nd grade life sciences project. $120 purchases microscope slides for a Middle School Project Based Learning science experiment. 12 payments of $12.50 buys one Kindergarten classroom an alphabet sounds teaching tub. $150 gets one 3rd grade classroom an engineering kit. Two payments of $100 pays for a Tiny Bug expert to come to school – ewwww! $225 a month for a year pays for TapRoot Theatre to come for two all-school anti-bullying shows. Two $500 payments pay for all-staff professional development on racial equity. 12 payments of $83.33 buys chapter books for grade band reading book groups. $2,850 pays for an all-staff full day professional development on Project Based Learning. $3,200 pays for every single 5th grade student to have their (sometimes first and only experience) of overnight camp at Islandwood. What will we do this year? Give. Grow. Fly. You can donate online, either as a one-time donation or set up recurring payments, or you can pay by check. 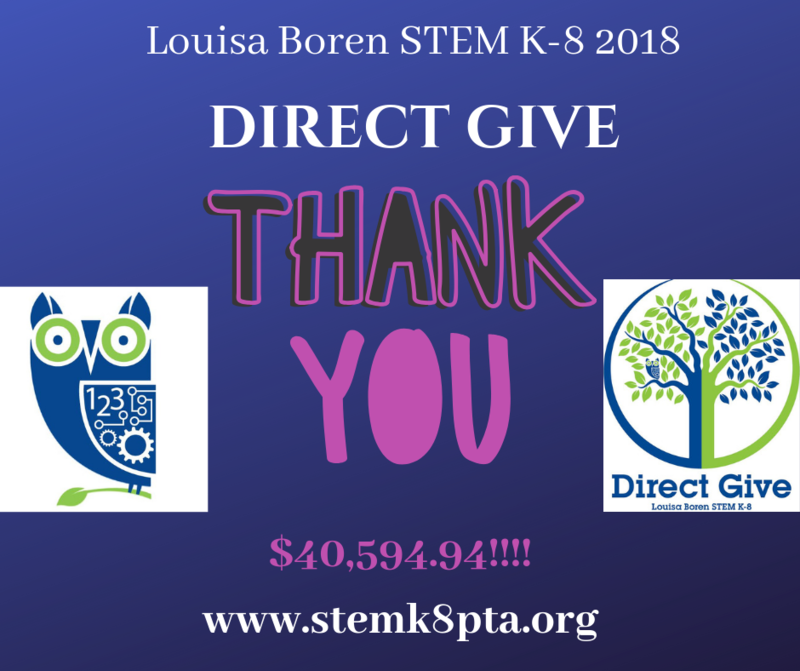 Thank you for supporting Louisa Boren STEM K-8 and all the owls in our tree. 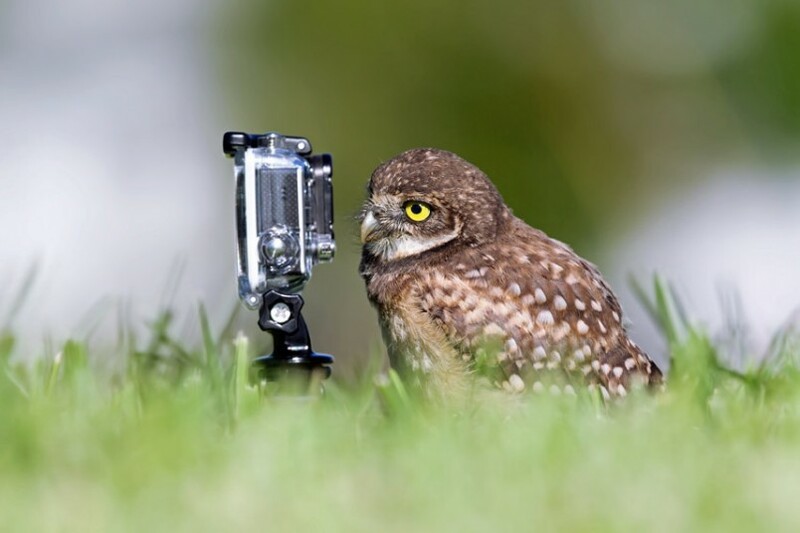 October 2nd is School Picture Day! Students should be in normal uniform attire. Join the new STEM K-8 Ultimate Facebook group, created by STEM 8th grade parent Debbie Atkinson. It’s a good way to communicate about snacks, carpooling and anything else related to our Ultimate players. Support our Fundraiser Right from your Phone! 40 paper copies also available! This year we have a new easy way for you to support STEM: purchase a mobile subscription to Chinook Book using our special fundraising link! 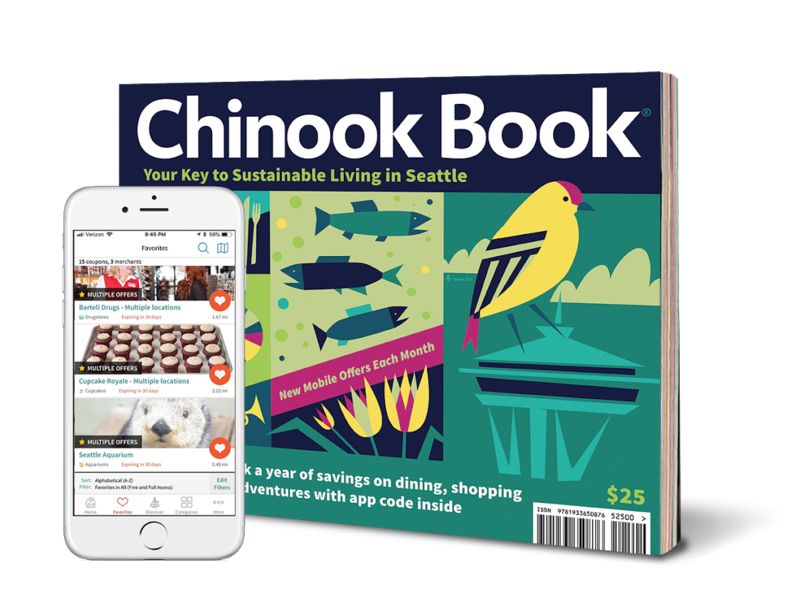 Don’t have the Chinook Book App yet? Tap the link below from your phone to activate a 7-day FREE TRIAL of the Chinook Book app. If you like it, you can purchase an annual app subscription for $15 and enjoy a whole year of savings at local, sustainable places you love like Caffé Ladro, Cupcake Royale, Seattle Children’s Museum, Elliot Bay Brewery & Curious Kids Stuff. Plus! Your subscription will continue to benefit our fundraiser year after year as long as we continue to fundraise with Chinook Book. Already have the app? First make sure you have updated to the most recent version of the app. Then tap the link below. It will redirect you to the App Store. Tap “open” and it will take you directly to the payment page with our partner ID already loaded in so your purchase will benefit our fundraiser. Don’t have email on your phone? Don’t worry! Just go to chinookbookmobile.com to download the app. Go to the “Purchase Full Access” screen on the “More” menu to pay for your subscription and enter the Partner ID “k8stemelementaryschool” to have your purchase benefit our fundraiser. P.S. If you would prefer to purchase a print book ($25) you can! Paper copies (which all come with a 12-month app subscription) will be available at the 1st PTA meeting (September 13), or you can contact me via e-mail or fill out a paper envelope (available in the office) and leave it in the PTA mailbox & I will get you a copy. Thanks for supporting our fundraiser! Happy last sleep before school Owls! We look forward to seeing you tomorrow! Late bell is at 8:55 am. 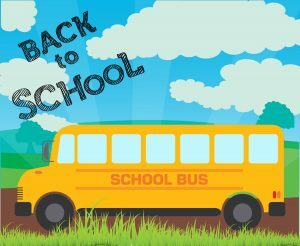 Remember bus drivers are checking routes and students carefully during the first week of school and will be running late. Be careful in crosswalks and school zones. 1st-5th classes will leave from the playground and Middle School will meet in the gym at the bell for homeroom assignments. 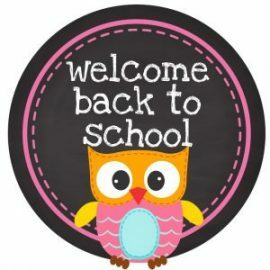 Join us for Decompression Coffee and muffins after the bell; meet new friends and celebrate the first day of school! Tomorrow is NOT an EARLY RELEASE Wednesday! So Owls need to be picked up the usual time of 3:25 pm. See you soon Owls! We are looking forward to a great year. Hours: Tuesdays and Fridays 8:30 am – 3:45 am, Thursdays 12:25 am – 3:45 pm. Welcome to another exciting year at Louisa Boren STEM K-8! Hello STEM community! My name is Danielle Blechert and I am your school counselor. Previously, I worked down the street at Highland Park Elementary as the Youth Services Assistant. There, I helped kids solve problems, worked to start a peer mediation program, and was an active member of the Race & Equity Team. Before that, I worked as a Youth & Family Advocate at a domestic violence shelter. It was a privilege to work with and support families during such a difficult time in their life. Trust is very important to me and I try my best to take time to build it. I chose school counseling for two reasons. The first is because I believe there is no such thing as a “bad kid”, just students who are doing the best they can with the tools they have. The second is I want to ensure students and families voices are heard and representing at all times in school. As your school counselor; I work to address personal/social, academic and career/college needs. 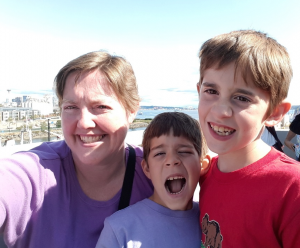 Some of my responsibilities are; talking with kids about topics ranging from anxiety to organization, facilitating small groups and going into classroom to teach lessons. I can also help with referrals to all types of community resources from the food bank, to immigration services, to housing. If you and your family need additional help; please reach out. 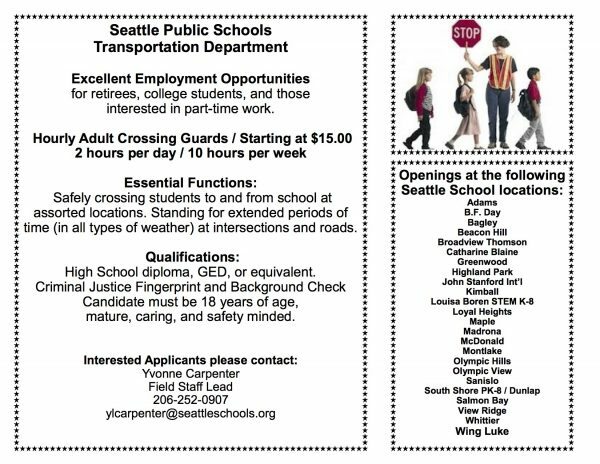 Being a STEM school; I am excited to help students explore various careers and, when applicable, connect them with community members who hold such positions. I come from a very small family- with only one cousin and one brother! I was born in a suburb of Los Angeles and am thankful to have grown up in a community that was very racially diverse. I look forward to getting to know you and your family and to learn from you. Feel free to email or call me anytime. Annual Back to School Bash for All STEM Families! It’s almost time to Back to School BASH, for the 7th year in a row, or LBSK8B2SB7! The Back to School Bash is a great way to connect with old friends and welcome new Owls into the community. 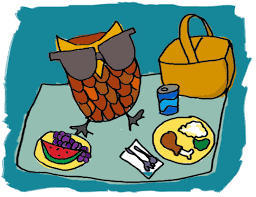 This event is Potluck Style – PTA supplies the hot dogs & lemonade – so please bring a dish or item to share. Location: Lincoln Park NORTH END Shelter 5 & picnic tables 60-84. Park on the street (be careful not to park in a restricted ferry line) or in the NORTH END parking lot. Walk in to the wading pool/playground area. Want to get more involved? Sign up to help with set up, grilling, and/or clean up; it’s super easy and a great way to meet other families. Save the date! 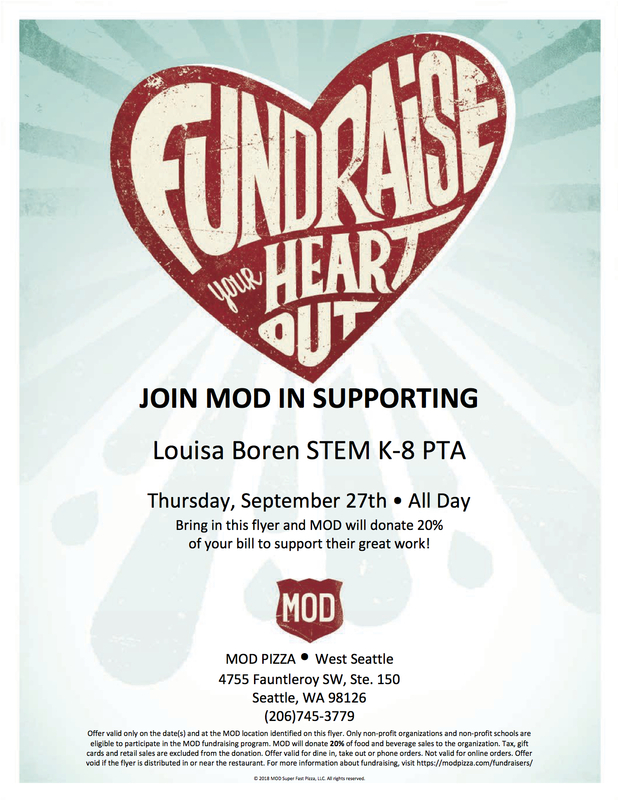 Don’t make lunch or dinner on 9/27 – MOD Pizza is donating to STEM K-8! Gluten free, salads, beer, wine – PIZZA & friends! Thank you MOD Pizza for supporting public education and our community! Bring a copy of the flyer with you and MOD will donate 20% of food & beverage sales to our school! Only valid at West Seattle location on 9/27. Phone, Dine-in, or take-out orders. Not valid on online orders. Flyers available at school or download and print. 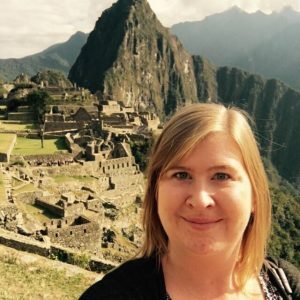 New to STEM K-8 and wondering about uniforms for your Owl? We have all the information you need here! We are so excited to welcome our newest Owls to the STEM community! There are two sessions for this year’s PTA-sponsored kindergarten play dates during Jump Start Week of August 20-24. 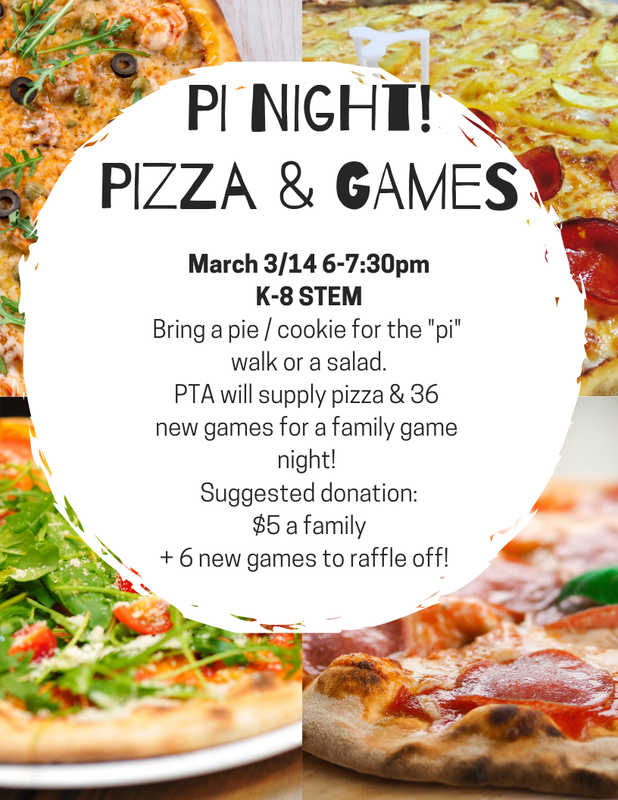 This is an excellent opportunity to meet other incoming families, current STEM families, and PTA officers and volunteers. All events will take place on the STEM playground. Join us for coffee and muffins to meet and chat with other new parents. All incoming K students and families are invited to celebrate the Jump Start halfway point with Popsicles. The PTA is seeking any incoming families or parents who would like to help support these events with set up, tear down, or just being present to meet and greet our Kinder Owls and their families. Please email president@stemk8pta.org to help. The last week of school is the STEM K-8 annual Spirit Week, sponsored by the Student Council. Here are the themes! June 18 : PJ Day Wear your PJs! June 19: Dress to impress! In honor of our 8th grade graduation, wear your favorite formal attire. Look sharp! June 20: Crazy/Tacky Day Crazy hair, crazy clothes. polka dots with stripes… Get wacky! June 21: Hat Day WITH UNIFORM This is our Lincoln Park field trip day so we ask that students wear uniforms so we can recognize and represent. HATS are encouraged though! June 22: Twin Day/Free Dress Day Match up with a buddy or two or three, or fly solo and wear what you want as long as it is appropriate. The first ever Louisa Boren STEM yearbooks are available for purchase! Students can pay for the yearbooks with cash or checks (payable to Louisa Boren STEM). How many Owls out there are looking forward to FIELD DAY!! Helped out with school events or activities this past year? You are welcome to join students and staff on Thursday, June 14 from 1:30-3:00 pm for the STEM Talent Show and Volunteer Appreciation event! Volunteers are invited to enjoy the super talented STEM kids and then head on down to the teacher’s lounge to enjoy the sweet satisfaction of having helped out this school year– by indulging in a dessert bar! Who doesn’t love a little dessert?